Everything You Need to Know About L'Oreal's Makeup Collab with Disney! Unless you have been living under a rock for the past couple of days, you may have noticed the newest makeup collaboration with Disney and L'oreal in honor of Mickey's 90th birthday! Today I went and snagged all that I could, and let me tell you they did not disappoint! First of all, when you go into Target, just go right into the clothing sections under the signs that say Mickey Mouse. I made the mistake and went into the makeup section... what was I thinking? The collection ranges from makeup to bath bombs, nail polishes, and more! If you are an avid Disney fan I would shuffle over to Target right now! Here is a look into what they have in store and some of the things I tested out and recommend! Can we just talk about this packaging? Too cute! The little Mickey on the front is just adorable. This palette only retails for $8 and has a range of smoky nudes! Including a metallic orange shade that is to DIE for. As with the first palette, this did not disappoint. The pigmentation is there, and the formula is so buttery! I am living for these colors. This could even be used as a duplicate for the Urban Decay Naked Palette! Both of these products retail for $7.99 and honestly, I bought them because of their packaging. On the plus side, I tested out the mascara, in the color Blackest Black, and good news! It does deliver! It actually did add more drama to the eyes. The eyeliner was likewise. Personally, I could never jump onto the smudgy raccoon look, but if you do it then OH BOY! This is the eyeliner for you. It even has a little smudger on the flip-side! When I tested it on my eyes, I used it in the upper waterline and it did smudge onto the bottom lashes...which was not the look I was going for but do with that what you will. This little palette retails for $6.00, and what can I say? I swatched all of the colors and it does what it's supposed to. The far left up top is perfect for you if you are also Casper white year round! The shades are also just a bit darker in person...just a fair warning. I actually found these little chapsticks over in the kids' section, but being a kid at heart, and that they only sold for $5, I could not pass them up! The two flavors of the lip balms are cherry vanilla and iconic chocolate. The flavors of the chapsticks include, from right to left: Perfect Pair, Oh-Boy!-senberry, Ch-ear-ful Cherry, and Silly Strawberry. Being a lover of all things cherry the rainbow colored one is my favorite! the lip glosses provide a hint of pink and red tints and lots of shine! 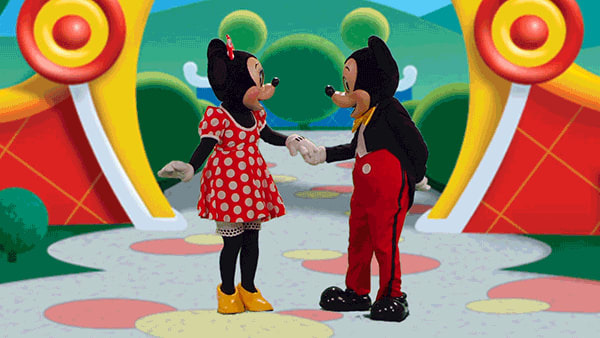 The set includes two shades: Pink Mouseketeer and Red M-I-C-K-E-Y. I did not get a chance to snag these because my Target was SOLD OUT, but I will definitely be on the hunt tomorrow! These shades include from left to right: Matte-Caron, Matte Mandate, Matte-ly In Love, Doesn't Matte-r, and Devil's Matte-vocate Red. Honestly, I think they missed the oppurtunity for some cute names, but I have heard that they're shades are already in their previous lines. These are the three facemasks I did not get a chance to find, but they are adorable, and I will be on the lookout! Each of these retail for only $3. Among other things, the collection also includes some personal care products. They have hand sanitizer that comes with its own little carrier. The scents include: Berry, Citrus, Mint, and Coconut. Plus, it retails for only $3! The bubble baths also have some stand-out packaging! They come with their own Mickey Mouse gripper sleeve, that is both decorative and gives you a non-slip grip in the bath! These scents include: Blackberry and Citrus Mint, and they retail for $4 a piece. They put out a line of three bath fizzies as well that are in the shape of Mickey's head. They come in Coconut, Cherry Blossom, and Lemon Meringue. All of the bath fizzies also retail for only $3 a piece. Target also came out with these four cosmetic bags. They will definitely let you travel with your makeup in style! The red striped bag retails for $10. The Mickey-eared bag and the clear bag both retail for $7. The black Mickey bag retails for $5. The last thing I came across (and bought) was this everyday makeup brush set. It comes with five brushes, an all-over powder brush, an angled blush brush, a pencil eyeshadow brush, a small defining brush, and a large blending brush. The hairs feel synthetic and they are also cruelty-free! They feel very soft on the face and blend nicely. Overall, I love the collection! It has adorable packaging and it is extremely affordable! You guys should all run to the nearest Target and pick up the set for the Disney lover in your life, especially if that person is you! Thank you for reading and go and check out my other stories! I just love writing!. Go check out my other stories!